India will soon have 100 more Vande Bharat Express trains, with sleeper facility added, said Railway Minister Piyush Goyal on Friday. He added that though the train will now clock a maximum speed of only 130 km per hour (kmph), it will touch 160 kmph once the route was completely fenced. “We are planning to start about 30 more Train-18s at the first stage. 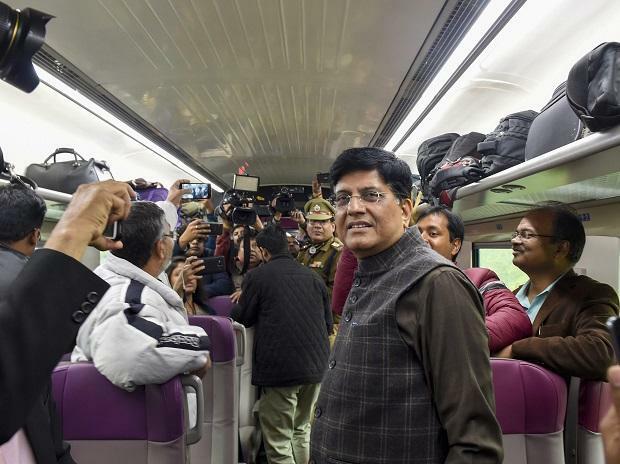 Overall, our plan is to roll out as many as 100 more Train-18s as soon as possible,” Goyal told mediapersons onboard the Train-18, inaugurated on Friday. Railways will keep Vande Bharat as the generic name for all the trains under Train-18 category. The new train is coming at a time when the country is planning to launch its first bullet train, that will clock over 300 kmph, by 2023. “We will meet the deadline. We are a bit late because of land acquisition issues in some areas,” he said. Railways has also identified 222 spots across the country where the national transporter can build bypasses to transport freight traffic, without touching cities. Asked about the biggest achievements, Goyal said, “Changing the mindset of employees, increasing investments by threefold, improving cleanliness and passenger amenities are the major achievements of this government.” One of the major challenges before the transporter during the last few years was its depleting operating ration. On this, he said, “We are expecting operating ratio to be around 95 per cent this year. The major reason for the depleting operating ratio was the implementation of seventh pay commission, the financial burden of which was around Rs 22,000 crore,” he added.